I’ve been wanting to pay a visit to Scott’s for a while, and finally got round to it for dinner with friends last week. I’ve heard lots of good things about the restaurant and I’m happy to say it didn’t disappoint. 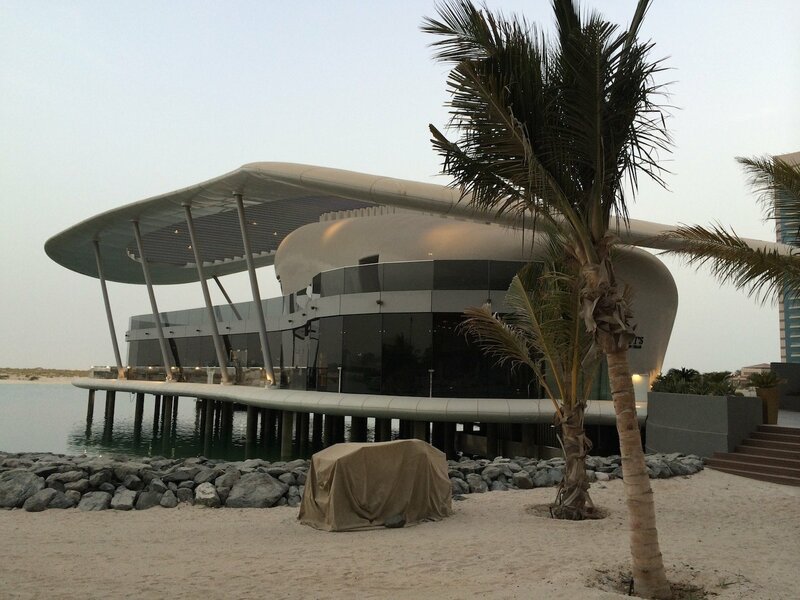 Scott’s restaurant is a traditional British seafood restaurant and is located at Jumeirah Etihad Towers in Abu Dhabi, though is in a building separate to the hotel, located down on the beach but with its own separate entrance that can be driven up to. As many of you will already know, it’s the sister restaurant to the renowned Scott’s in London’s Mayfair so expectations were high. The iconic building (if perhaps a little reminiscent of the Starship Enterprise!) is without doubt in an impressive location and certainly affords beautiful views from inside the restaurant, though if it’s the views you’re after you should take note to visit during the daytime as at nighttime it’s too dark to see too much. 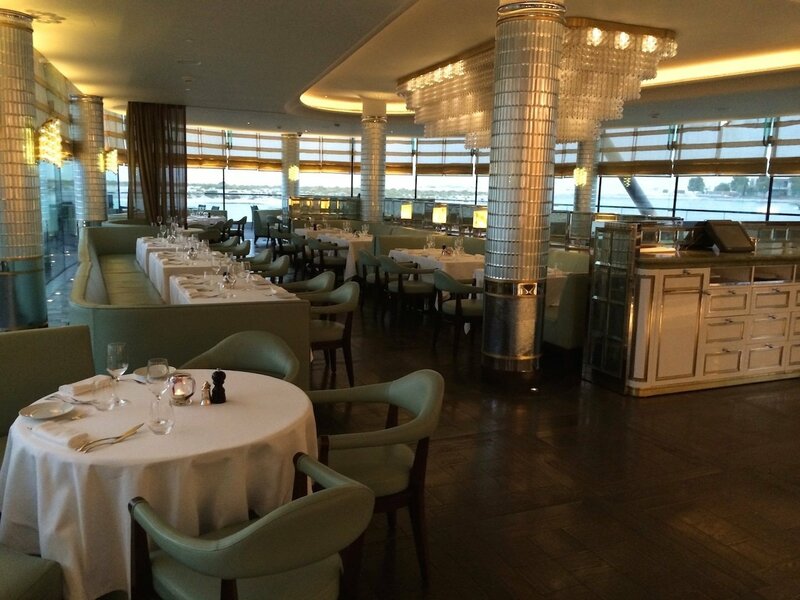 The inside of the restaurant is decorated in a modern and elegant, art deco style. There’s also a deck upstairs for dining and post dinner drinks in the cooler months. The range of seafood is as you would expect, extensive and wide-ranging including oysters and caviar, lobster, fish and much more. I plumped for the Deep Fried Haddock and chips which is listed on the menu as being cooked with alcohol – it’s only a small amount of beer for flavour in the fish batter but it’s worth noting that most of the dishes containing alcohol are also able to be requested without the alcohol for those who require or prefer. 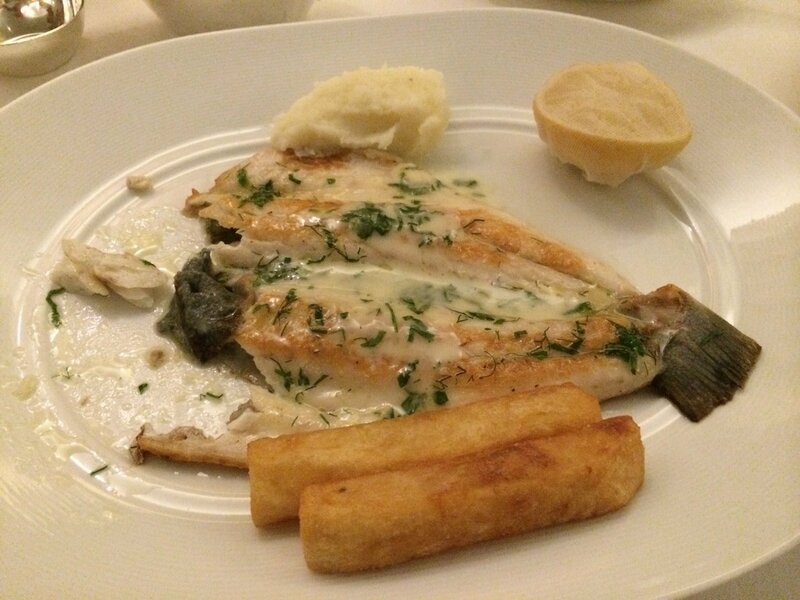 The fish was perfectly cooked, with good crisp batter, no sogginess in sight. 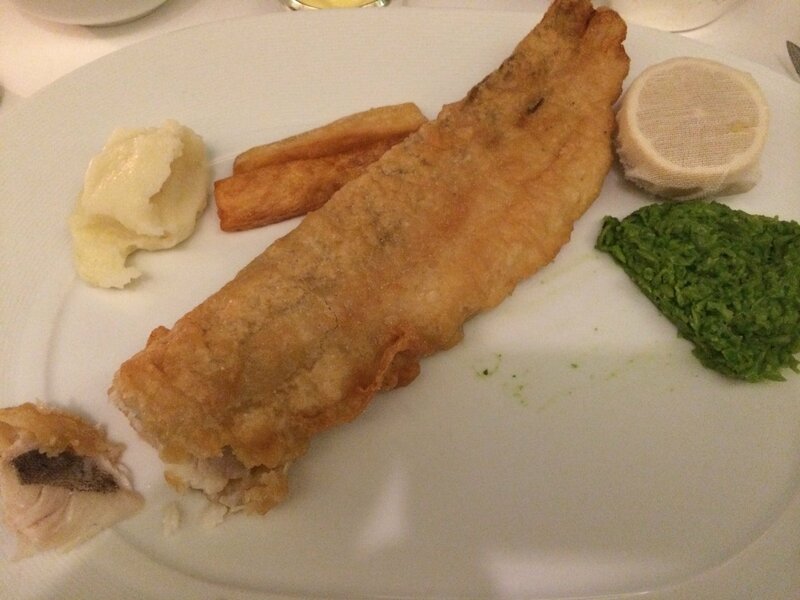 The dish also came with minted pea purée and a side dish of chips. Not just any ordinary chips mind you, the type of chips that are oversized and appeared to be several times fried to give them that distinctive textured and crispy outer coating. Very tasty. Mr. Arabian Notes went with the Whole Seared Sea Bass with Lemon and Herb Butter and some mashed potato as a side dish. I’m afraid I wasn’t quite quick enough to capture the plate on arrival at the table before he’d taken a few bites! For dessert, I tried the Strawberry cheesecake and was pleased to note that it came with a real biscuit base which was firm and didn’t fall apart but that wasn’t too hard either. It was a real pleasure to find a ‘real’ cheesecake as all too often in this region I have found that cheesecakes come either with a sponge base (what’s that about?!) or with a very loose and crumbly biscuit base that falls apart on slicing which is just not right! 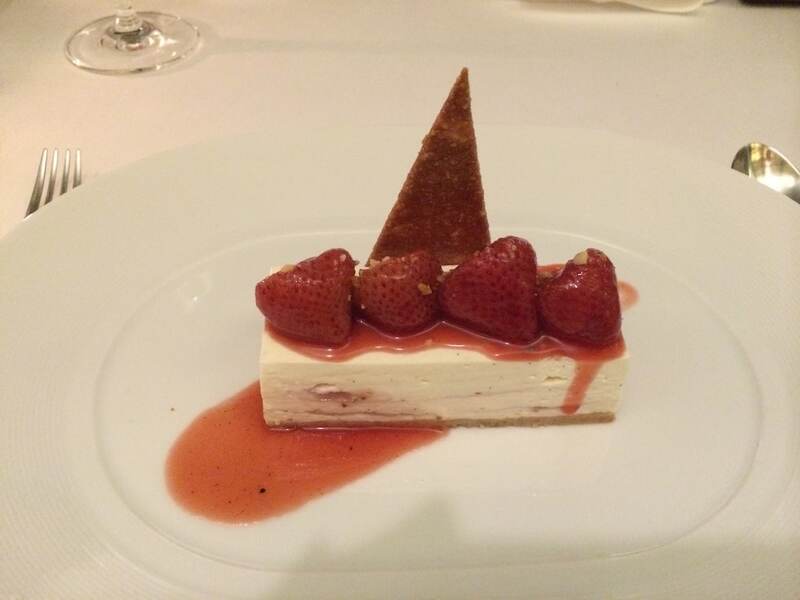 So top marks for that one to the chef – a proper British Cheesecake in a real British restaurant at last – hurrah! 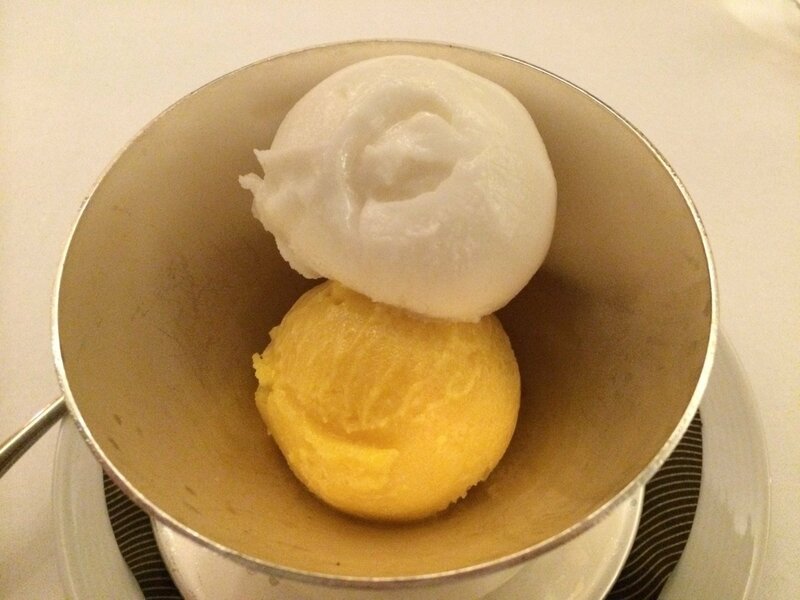 The texture was also perfectly smooth and creamy and the flavour distinctively strawberry but perfectly balanced. Yum. Mr. Arabian Notes is a big fan of sorbet so was pleased to see a range of flavours on the menu and settled on a scoop of lemon and one of mango. I managed to get a photo of this one before he polished it off, and there were certainly no complaints. Overall, we enjoyed a great meal and were also very pleased with the service. Our requests and substitutions were met without any problems and there were no issues with a language barrier or understanding as can often be the case in the UAE. All in all it was a pleasant evening, with great food, excellent service and in a beautiful environment. Whilst it’s not a restaurant that I would frequent every day – it’s one I would reserve more for special occasions or when you have someone you want to impress – I would definitely return, and certainly plan to! UPDATE: Scott’s at Jumeirah Etihad Towers has CLOSED as of mid 2015.